CHECKSUM is a small utility which calculates the MD5 or SHA1 filehash of a file for you. The program has a batch mode which can calculate the checksum files for everything you give it. To do that, just type in the path of the directory and choose your options: recurse, synchronize, individual checksums, etc. 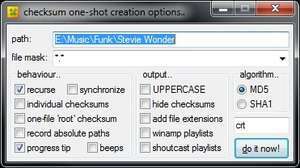 CHECK can output in uppercase and add file extensions, as well as support Winamp playlists. Version 1.7.0.1 is a freeware program which does not have restrictions and it's free so it doesn't cost anything. For security reasons, you should also check out the CHECKSUM download at LO4D.com which includes virus and malware tests. Additional screenshots of this application download may be available, too.